At the end of last week I was in Amsterdam for the first of a series of meetups and workshops I'll be doing for Fronteers as part of my role as their representative at the W3C. For the workshop part I led a spec reading workshop on the Multicol spec, the spec I'm co-editor of. It was incredibly useful, I've already made some fixes to small issues that were spotted and will be raising issues over on GitHub for things that need wider discussion by the working group, or at least between me and my co-editor. There is a report here of this first visit. This was my first trip of 2019, and I am now looking forward to the things lined up over the next few months. As with every year, I claimed at the end of last year I was not going to create ridiculous schedules for myself. Here we are in February with me working out what time I expect to have finished a triathlon to make sure I have time to make a flight to get to an event afterwards. This week the email is sponsored by An Event Apart, my next conference speaking engagement is at An Event Apart Seattle. Thanks to them for their continued support of this newsletter. There is a reasonable amount of design-related stuff this week, rather than just the purely technical. I hope that some or all of it is useful! An excellent article arguing the case for letting the browser do its thing, rather than trying to customize or control browser functionality. Slides: What's New In CSS? The slides and code for my talk at the Fronteers meetup in Amsterdam last week. Chris shows the technique he uses and asks how other people do this. Check out the comments for more. "By stripping away the visual cues that help users distinguish between interface elements you are purposely making a worse experience for them." "What if we design websites exclusively for people with disabilities?" This site rounds up some of the best design case studies written in 2018. Some interesting stuff to browse through here. Light up your life and push your skills to new heights. Discover the future of UX design and front-end development at the web conference that’s been shedding light on our industry since 2005. Join the brightest minds in design, code, and content for three days of illuminating techniques and eye-opening insights. 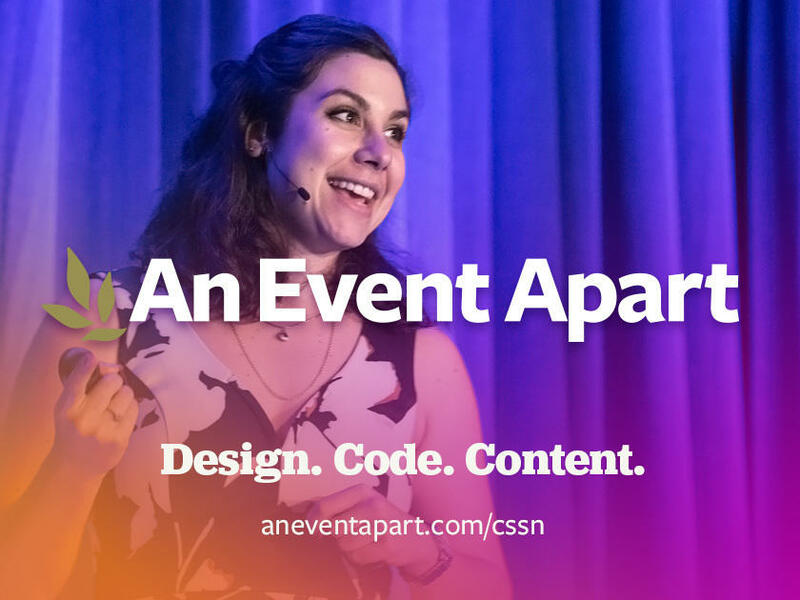 An Event Apart brings together 17 brilliant speakers—our industry’s guiding lights—on a single stage. From designing with your customer, instead of for them, to the Zen of whitespace; from variable fonts to voice UI design; every session lights the path to the future while helping you create the best possible experience for your users right now. Join us in 2019 and save $100 off any two or three days with code AEACSSN.